In today’s tight economy, many associations are re-examining their role to find the most important ways to support their members. This association GETS the purpose of formal member input. 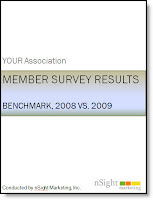 Here’s more about the comment she made: “A member survey helps remind us what’s important to the TOTAL MEMBERSHIP of the association – not just the current leadership, or the staff alone. At the office, we get wrapped up in what we do every day. We promote the programs we’re responsible for. The staff and leadership are always coming up with something new to offer to members that will help them avoid risk or enhance productivity. So we have a case of “what’s new”- itis. We have the same problem in our city with restaurants – there are hundreds of people at the new restaurant that opened. There are only 12 people at the new-ish restaurant that opened 6 weeks ago. But that 6-week-old restaurant is really just getting good. The staff is finally trained; the chef is familiar with the food. But like that old restaurant, we want to move onto the newest project we’re working on. And we need to show the leadership that the newest project is successful. So we go full steam behind it -to the detriment of the stuff we created last month or last year – even if that stuff is actually more important to the members. Association marketers and staff play a key role by providing your leadership insight into what members want and which programs are worth hanging on to.